A team including physicists from the University of Basel has succeeded in using atomic force microscopy to clearly obtain images of individual impurity atoms in graphene ribbons. 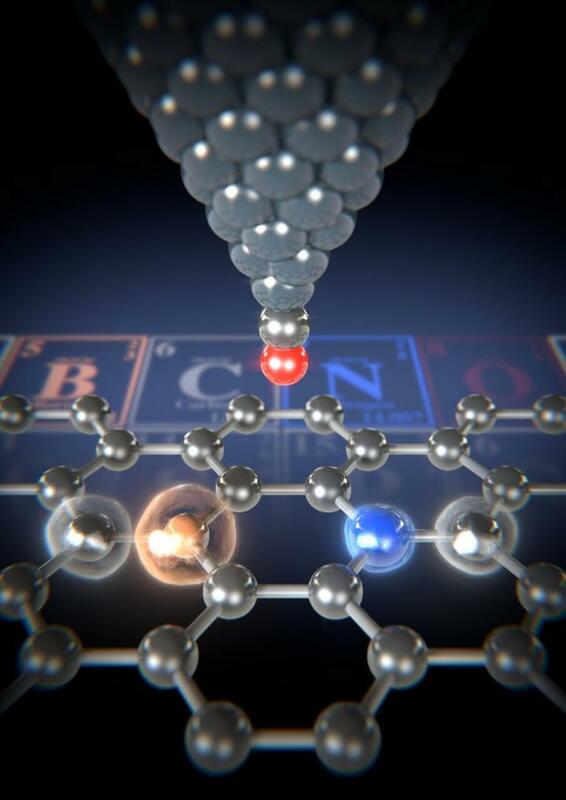 Thanks to the forces measured in the graphene's two-dimensional carbon lattice, they were able to identify boron and nitrogen for the first time, as the researchers report in the journal Science Advances. Graphene's distinctive properties can be further expanded by incorporating impurity atoms in a process known as "doping". The impurity atoms cause local changes of the conduction that, for example, allow graphene to be used as a tiny transistor and enable the construction of circuits. Scientists from the team led by Professor Ernst Meyer from the Swiss Nanoscience Institute and the University of Basel's Department of Physics examined these graphene ribbons using atomic force microscopy (AFM). They used a carbon monoxide functionalized tip and measured the tiny forces that act between the tip and the individual atoms. This method allows even the smallest differences in forces to be detected. By looking at the different forces, the researchers were able to map and identify the different atoms. "The forces measured for nitrogen atoms are greater than for a carbon atom," explains Dr. Shigeki Kawai, lead author of the study and former postdoc in Meyer's team. "We measured the smallest forces for the boron atoms." The different forces can be explained by the different proportion of repulsive forces, which is due to the different atomic radii.